wedded to the markets – seeking my millions, focused on the oil market, a weakness for jazz. 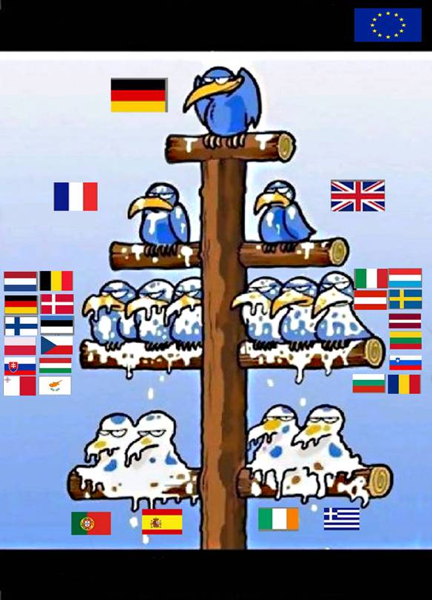 Got this picture this morning from a friend of mine and think it sums up the situation in Europe perfectly. To clarify the situation – Ireland has accepted a multi-billion pound bail-out which may trigger a cut in the country’s credit rating. But that isn’t even the worst of it. The Government is threatening break-up with calls for General Election and claims of exiting the coalition from the Green Party. And to increase the amount of political uncertainty, the PM himself is under pressure to quit. From an investor’s point of view the risk is an exit of those in the market. Last Monday, after the announcement, the EuroStoxx closed down 1.2%. Putting the situation in the context of the “Greece Crisis” – the Ireland bail-out package is 60% of GDP versus “only” 47% for Greece. The Irish Stock Exchange rebounded by 1.8% from relief senior bond holders will not be forced to take a haircut under rescue package. However, in the bond markets the premium investors demand to hold Irish government debt over the German benchmark bunds remains near record highs after the spread only narrowed by 6bps. “We are hopeful that a little more calm and a reality will come back to the markets’ valuations,” G finance minister told German radio station Deutschlandfunk. Majority (57%) of those polled by Quantum Research for the Sunday Independent newspaper want State to default on debts, believing it cannot support the debt burden it has taken on which would involve annual interest payments of around €5bn over 9 years. Opposition was taken to the streets with around 50,000 people registering their disapproval of the Government’s 4Y plan to cut the budget deficit to 3 per cent of GDP by 2014. \”The ECB f**ked us,\” one government official in Dublin was reported yesterday to have said. BOTTOM LINE: This all adds to political uncertainty as we approach the publication of an austerity Budget on December 7. Possible Contagion: Portugal remains under pressure – Nouriel Roubini (Economics professor, Chairman of Roubini Global Economics), believes that the Lisbon government should seek a bailout quickly. Market Irrationality: Lagarde has said the market was wrong to price the cost of Spanish debt at the same level as more risky countries such as Pakistan and Romania. 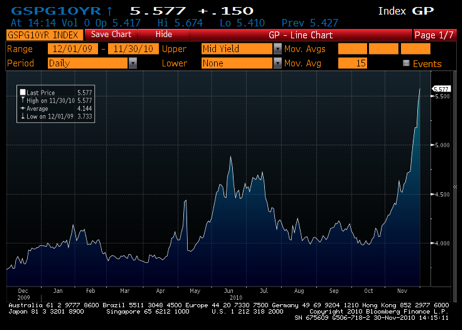 Governments fail to allay market concerns of future defaults – historical moves in yields….